SALT LAKE CITY, Utah (WLS) -- A Utah waitress scored a big tip on a slow shift at work thanks to the kindness of strangers. Last week Bre Snow left work thousands of dollars richer. A group of Michigan football fans were in Salt Lake City for a game against Utah. 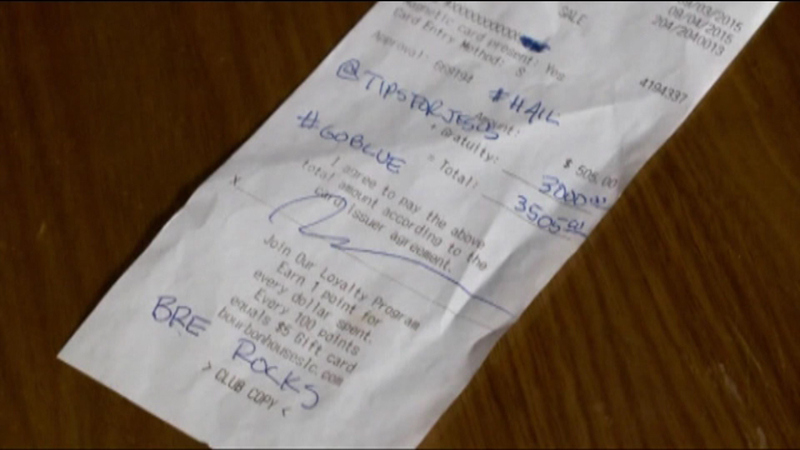 After rounds of drinks and food, waiting for her at the table was a receipt was a $500 bill with a $3,000 tip. "They're like, 'We want to give this to you, we want to make your day,'" Snow said. "It did and I started tearing up." The group snapped a photo and pointed Snow to an Instagram page for the user "tips-for-jesus," where similar moments have been captured at restaurants all around the country.